Without expectating any return, the clouds give the rain to the world. Since, Karunakara Perumal resembles as Kaar, the clouds, he doesnt expects anything from his bhaktas but he only the pure bhakthi from them. Since, the Perumal is not expecting from anything but only, the pure bhakthi and show Karunai (Courtesy), the Perumal is called "Karunakara Perumal". Thaayaar - Padmamani Naachiyaar (Raamaaamani Naachiyaar). 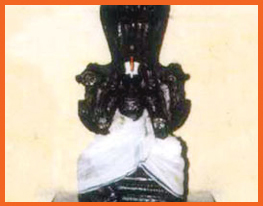 The Moolavar of this Sthalam is Karunakara Perumal. He is found in Standing position facing his thirumugham towards South direction. This Divyadesam is also found inside Ooragathan Temple, Kanchipuram.